You want to use a double drive wheel but are a little unsure or you just can’t seem to make it work. Maybe you just feel like it’s not working as well as it should. I had a conversation on Ravelry a while ago that I’m going to cut and paste a lot of the information over here. We were talking specifically about a Schacht Matchless but I’ll throw in some info about production wheels. I love to spin in double drive and have always used double drive when I can. I don’t like my wheel to have a ton of pull but it has enough take up to work. My standard method of draw is sliding long draw and I love slightly woolen yarns. I find that double drive is easier on my hands and is more fluid method for me. Though, I can spin/draw relatively the same on scotch tension I just love the feel of double drive a little more. Its why I tell people all the time that it’s a personal preference thing. Let’s go through the wheel and do some spot checks. The drive band adjuster works – it’s clean (free of dust and fiber). If it’s metal it can use a light coat of lube, otherwise don’t. If it’s wooden and squeaky, clean and use beeswax. You’re bobbin is lubed on the shaft and pointed in the correct direction? On the Matchless, the big end of the bobbin is for Scotch tension, the little end is for Double drive. It won’t work happily the other way around. 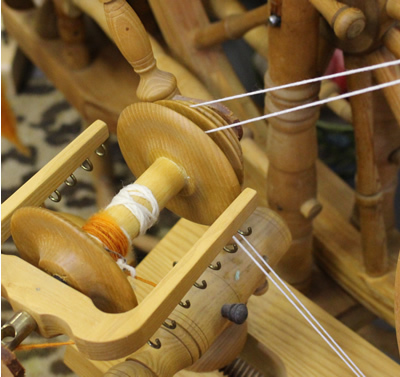 If you’re using the 4 fastest ratios (only on the optional whorls Hi-speed and super Hi-speed) and you use double drive, you will need the fast bobbins – the smaller end on those is smaller than the regular bobbins. You see, in order for a wheel to work properly the bobbin has to have more take up than the flyer (they need to spin at different rates). On scotch tension you get that with a brake. On double drive you get that when the bobbin has a smaller pulley than the flyer whorl. The mother of alls are seated properly and hold the flyer/bobbin assembly well? They should be upright and locked. There should be a little play with the bobbin on the shaft but not a ton. The bearings that hold the shaft and orifice are working properly (cleaned and oiled)? If you have a wheel that is using leather – don’t oil leather. Use a good saddle soap to help condition the leather. The drive wheel turns well and isn’t warped? If it’s sloppy on the drive leather washers can be added. A little play isn’t a problem. A lot of play and it can throw your drive band. The treadle(s) operate freely with no rubbing? Fix it if they are. There are ways to adjust. There should be no rubbing. What is that made of? Cotton, hemp, mercerized or not….all good cords. Some people like silk. Not too thin, not too thick. Find what makes you and your wheel happy. Cotton for drive bands may be the easiest to find. Hardware supply stores have string chalk refill that has no chalk on it. That stuff is what many people like. You can try the hemp or silk or other yarns as well. There was an article that Beth Smith wrote for Spin off that talked about drive band materials. I think it’s a personal preference. Keep the cotton if you’re happy but when it needs changing, try the hemp or something else. My personal favorite is sport weight mercerized cotton. You may find different wheel prefer different cording but this is the one that I like for me and the wheels that I run. Never use poly cord for a double drive. it rubs against each other and doesn’t work well. It’s one continuous length of cord? The answer to this needs to be yes. It’s knotted properly? Square knot or a surgeons knot should work just fine and not come undone. If it comes undone and you have made the knot properly, chances are the cord is too slippery. You can also sew your drive band. Knots are the quickest and easiest but find the method that works for you. It’s correctly tensioned? A previous posting on replacing drive bands, talks about tensioning You don’t want it too be so stiff or really loosey goosey. You will over time find YOUR correct tension but for now set it at tight but so that it has a little play like it shows in the photo on that blog post. It’s not too slick or falling apart? – it seems silly to have to mention this. If your drive band is unplying, falling apart or can’t stay tied, then there’s a problem. Change your band. You need this to work well. It drives your wheel! Your wheel is in good working order right? You went through these spot checks and you fixed the problems you had and made good friends with your wheel since you’re taking care of it. I can tell you, the drive band is usually the biggest problem that people have with making their wheel work. Too loose, too tight, too delicate, wrong material….. All of these things can kill your spinning experience. Do what you can to adjust it properly and if you continue to have issues or are just unsure, take a class or see the shop where you got your wheel. Talk to them about maintaining and checking on your wheel to make sure that it’s set up properly. You bought an antique and think it might need a repair. Find a guild that can evaluate it or a reputable shop/repair person that is able to help you. This entry was posted in spinning, Uncategorized. Bookmark the permalink. Thanks for all the great info!, Amy! 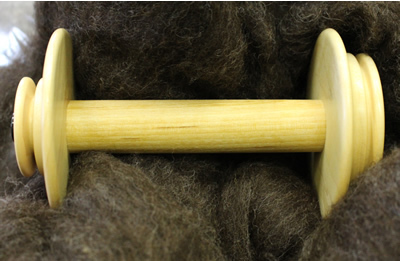 I’ve only ever spun on a scotch tension wheel, which doesn’t need oiling. I’d love to try double drive sometime, just to know the difference! I cant get my rive band to stop falling off my double drive. Anyone have this problem or know how to fix it? Is your wheel lined up with the whorl?